Two Bears Farm and the Three Cubs: Horse Diaries: Risky Chance Book Review and GIVEAWAY!! Horse Diaries: Risky Chance Book Review and GIVEAWAY!! Last Spring author Alison Hart asked me to do a book review and giveaway on two of her horse books. I so thoroughly enjoyed reading them that when she told me she had a new children's book coming out, I jumped at the chance to read it. 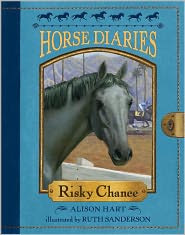 Risky Chance is #7 in the popular Horse Diaries series, which are generally set in the past, at a time when horses often served a larger purpose. This novel is set during the Great Depression, and Chance is a gray thoroughbred born in California. The story is narrated from his point of view, in a style reminiscent of Black Beauty. Things start off well for Chance, even though he is highly spirited and not interested in being trained. He spends his days prancing through pastures and racing his filly friend Sweet Dreams. Finally, Chance relents to being broken, and proves himself to be incredibly fast. He runs his heart out for his jockey Wolf, and Wolf's affectionate daughter, Marie. But one unfortunate day, a terrible injury removes Wolf from the circuit, and Chance falls into less kind jockey hands. When a bowed tendon threatens his ability to run, Chance is sold as a claims horse. In each claims race, all of the horses are for sale at the same price. The buyer can buy any of the horses before they race, and then afterwards claim them regardless of whether they have won or lost. With every claims race, Chance's injury worsens, and his heart falls deeper and deeper into despair. The only one worse off than him is his old friend, Sweet Dreams, who also became a claims horse, and is in terrible shape. But one day, after Chance races, Marie shows up! She tells Chance that she has come to claim him, and that she will take him home. Wolf is damaged too much to ride, but he sold his car to bring Chance home. Their place isn't much, but Chance has clean water and a bed of hay. Marie begans tending to Chance's injury and nursing him back to health. But the pressure is on. If Chance can't win in the races again, Marie and Wolf will lose their home - he simply must win so that they can pay the bills. And what about Sweet Dreams? Will she ever find happiness? This book is for children in the 8-12 age range, and is just the sort of horse book I would've loved as a child! After reading this as a kid, I would've rushed out to get the Horse Diaries no doubt! The back has an appendix full of interesting history and statistics about thoroughbreds. Furthermore, there are absolutely gorgeous black and white sketch illustrations throughout the book, done by Ruth Sanderson, that your child will love. You can find out more about Alison Hart by visiting her website here . She has written over 20 mysteries and historical fiction novels for children and teens. And she has generously offered to give away one copy of Horse Diaries: Risky Chance! This would make a great gift for a horse crazy daughter or grandchild! To enter, just leave a comment and let me know your email if it isn't visible in your profile. The giveaway will run through October 11th at noon, when a winner will be chosen by Random.org. Winner has 48 hours to respond, otherwise a new winner will be chosen. This giveaway is open to residents of the United States and Canada. Thanks for entering! This looks and sounds like a book my daughter would just love. Please count me in. I have 2 girls in the recommended age range. I think they would both love it...I will just be thankful that we live in a subdivision - so no begging for their own horse!!! Thanks for stopping by my blog too! Great review. I've been considering giving Evie lessons. I think both my daughters would love this book. I think I'd like to read the book myself. I love mystery novels. Please enter me in! You are a very good book review writer!! I think I will not enter this time, to give others more of a chance, we don't really have any kids this age yet. Good book review, Lisa... Please don't enter me into the giveaway. I just don't participate anymore in Giveaways... Thanks anyway. I was horse crazy as a girl and would have loved these books! If only Amy was still in the age range for them...I have a younger nephew though:) He would love them! Great review, Lisa. I love her books. looks like a good read & a nice review!! don't enter me though...no little ones for me!! I think we're in the same triberr tribe or something. NOt sure how that works exactly, but I thought I'd come and meet you anyway! I have twins too! Mine are 7 year old girls. I think it's good to be aware of this genre. I hope my boys are big readers like me and I'd like to be able to direct them to good authors! Thanks for this. Oh what a great giveaway! I have two nieces that live close and they each have horses and they love them so much. This would be great for my daughter. Most girls really love horse storis... Thank you! This sounds like a book my daughter would really like. Thanks for the giveaway. I love that this is from a historical point of view. thank you for the contest! My daughter loves horses, and although she can't read yet, I'm sure she would love it if I read it to her! JBird loves horses every since she had a "pony party" for her bday.